This is a nice, easy to grow plant, Hoya carnosa 'Krinkle 8'. The leaves have eight "dimples" on them, giving it it's name. This has been blooming in our kitchen window for a few days. You can't really go wrong with this dandy little plant. It's soft "fuzzy" spines and bright orange flowers are outstanding. And that myth about cacti flowering just once and that's it...well, that is just a myth. Some are more like that, but not this plant. In some recent treatments of these genera Manfreda is placed within Agave, making this an interspecific Agave hyrid rather than an intergeneric. But the jury still seems to be out so we'll keep the x Mangave label for now. Whatever it's botanical name, it's still 'Bloodspot', a very appropriate name. It's probably quite hardy, but not hardy enough for us here in the Willamette Valley of Oregon. Not a big deal because it makes a very nice potted specimen. We had our succulent society picnic here earlier today and it was a lot of fun, with about 20 people showing up. But of course I got so busy with other things that I forgot to get out the camera. So...no photos. It was really good to see so many of your here. No people photos, but here's another Echeveria crest, this time Echeveria 'Fred Ives' crest. I don't know what happened, but the video clip appears to have stopped working. I'll try to figure it out. In the meantime, we're heading off to the Oregon State Fair tomorrow. This is my first attempt at doing this, so bear with me. Our Epiphyllum oxypetalum flowered tonight, so I thought I'd attempt a time lapse video of the flower opening. Next time I'll try adding some music and some effects. Echeveria elegans can produce some downright beautiful crests. This is one of several that we have and each one has its own character. I haven't had much time to be taking photos as we've been doing our annual clean-up. We're filling a 20 yard drop box with a lot of general "stuff" that's just been around too long. But it's hard work and I don't have much time for anything else. Then we plan on going to the Oregon State Fair with our son and granddaughter on Friday, followed with the Oregon Cactus & Succulent Society Picnic meeting on Sunday afternoon...Whew! On Monday, I think we'll crash! These are sometimes sold as the "Christmas Tree" cactus and understandably so. Just today at our little sale in the yard, a person commented that they looked like little Christmas trees. Not that this picture shows that off too well... Maybe it's a Christmas Tree farm. Actually, what it is, of course, is Austrocylindropuntia subulata monstrose. OK, I understand why they don't push this name in the stores. It's a mouthful. 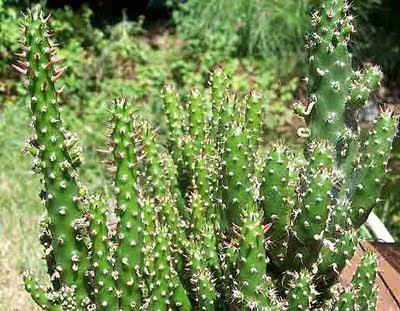 But it tells you quite a bit: Austro (south or southern) cylindro (cylindrical) opuntia (a member of the opuntiads, a grouping of plants in the cactus family). It comes from the higher elevations in Ecuador and Peru and is quite easy to grow. 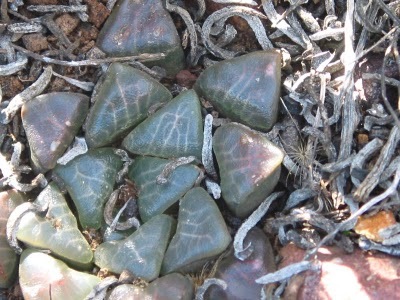 These are some seed grown plants of Haworthia bayeri (EA937). Understandably, they're highly sought after. David Martin originally seeded these and posted a picture taken by him and Scott McDermott while on their trip to South Africa several years ago. This the the plants in habitat. Obviously we had just watered in this area! This is x Pachyveria andreae 'Claire', a very nice, easy to grow succulent plant. We've been a bit swamped for a small nursery recently, but it feels good. Two international orders being inspected by the agricultural inspector tomorrow and several other orders have gone out in the last couple of days. We might even be able to upgrade the other computer this year. It sure needs it. In my opinion, this is one beautiful plant, what with the striking markings and wonderful form. When it's not flowering, it's often confused with haworthias, but once it flowers, there's no mistaking it any more. I tried. I really tried. The light was hitting the flower just right through the kitchen window and I wanted to catch the glimmer of light through the nectar droplets on the flower. Not very successful. I even tried to find the tripod, but it's never where you want it when you need it! So...a jiggly photo. This is one of Lynn-Marie's crosses; she calls it 'Lemon Kiss'. The photo doesn't quite bring out the yellow hue correctly, but it's close. There's just not enough time in the day to get all the work done that needs to get done. Help!!! I've posted this before, but the colorful highlights of late summer are just to nice not to be posted. This is not commonly available. I recently mentioned that these were blooming like mad. This is what I mean. 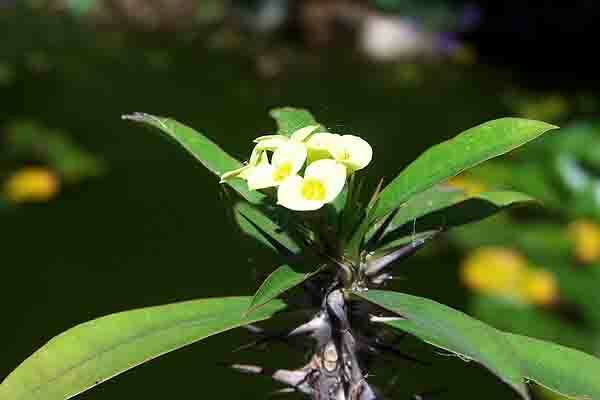 This one small plant has masses of flower buds and four were open yesterday. Lynn-Marie captured the picture and I'll try to get some more later this week using the tripod, while trying to increase the depth of field. But without doing all that, this picture tells it all; you can hardly see the plant for all the buds! We've had this old Pleiospilos simulans around for quite a few years and it looks like we're going to have an over-abundance of flowers in the next few weeks. And they're so nicely scented. This aloe shows its best colors if kept on the dry side during the winter and under those conditions can accept temperatures to near 25F. It's a summer grower and adds a great accent in the right place. For those in the Portland, Oregon area, we'll be having a plant sale on our lawn next weekend, August 20 & 21: Saturday, 10 am to 7 pm, and Sunday, 10 am to 5 pm. Drop by for a cup of coffee or soda and conversation...and perhaps find a plant you just can't do without :) . This is separate from the OCSS picnic and open house on the 28th. Directions to our place are at the OCSS site. One of the several forms of Crassula falcata was flowering today, so of course I had to take a photo. This is one plant that, if we had the weather that permitted it, I would grow outdoors year around. And I know just where I'd put it. But that's all just fantasy. I'll just have to enjoy it as a potted plant, as do most of us. Even in the summer when dormant, the "botterboom" or "Butter Tree" continues to provide interest due to it's wonderful flaking skin. We find it to be an excellent potted specimen and fairly easy to grow if not over-watered during dormancy. Mammillaria polythele var. inermis doesn't exactly stand out in the crowd when it's not flowering...but then it flowers. Almost fluorescent! Almost forgot about this one hiding out on the floor of one of the greenhouses. No forgetting it now. We've always known this as Aporocactus flagelliformis, but I understand it's now considered a Disocactus. It's hard to keep up with the lingo sometimes. But that's OK, since either name is correct. After all, that's what synonym means. I've often said that it's good to have a magnifying glass at hand (or a close-up lens) in a nursery. That nice, almost fuzzy appearing, "rat-tail cactus" isn't fuzzy after all. It's wearing spurs. This is the pink flowered form of Avonia quinaria ssp. alstonii. A lot of these are flowering now, both the white flowered and these. Really neat plants. This is the most common of the Pachypodiums, Pachypodium lamerei, commonly called the Madagascar Palm, though - of course - it's not a palm. There's a reason it's more common: It's quite easy to grow. That's a plus, not a negative. Sure, there are some more interesting Pachypodiums, but some of them are a bit of a challenge - at least in our climate. But, of course, we like a challenge; but not everyone does. These are just the plant for you, perfect for your deck or porch during the warmer months, and doesn't particularly object to a dry treatment during the colder months. I'll keep my words to a minimum tonight; I'm tired. Maybe it's a sign of getting older, but, hey, what are the other options? 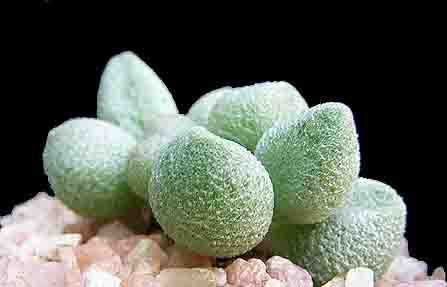 This is big, fat and sassy Haworthia emelyae var. comptoniana. A plant doesn't have to be rare to be interesting. In my opinion, a nicely grown "ordinary" plant is better than a poorly grown rarity any day. Don't misunderstand me. It's not that this plant is "ordinary", it's just not what most would consider "rare". Often listed either as Euphorbia symmetrica or totally swallowed up within E. obesa, this is a beautiful form of the plant. For now, we'll accept the monicker: Euphorbia obesa subsp. symmetrica. This is still a small plant but the markings are already impressive. From the first year we started growing succulents, back in ancient times ;), we've always kept this or one of it's cousins close at hand. Meet Fouquieria purpusii. Related to the Boojum Tree and the Ocotillos, this photo is of a beginning specimen which will soon exhibit its characteristic stem markings as it grows bigger. Slow growing, especially when confined to a pot. Look closely. You'll see the nectar dripping in profusion. That's one reason it's hanging outside on our fence. The other is, I think they're enjoying the fresh air. In fact, I'm sure they are. The flowers on this Hoya are velvety. Another one of the Lobivia (Echinopsis) hybrids was flowering yesterday, and it has about 8 more blooms to go. The only name we have on this one was what was written on the original label: 'Beautiful Pink', which could very well be simply the previous owner's description. An apt description. Weather now is the summer weather we wait for and enjoy here in Oregon. Night time temperatures into the mid to upper 50sF (13-14C) and daytime temperatures right around 80F (27C). Ideal. This particular crassula doesn't get enough attention. Its small, fuzzy leaves are attractive enough but, because of its size, it's and easily overlooked. Until the other day. I was going through the Haworthia section and a tray of these was there in the middle of all those haworthias. Wow. Not overlooked. We've also been able to propagate some more of these plump little gems and have returned them to our online listings. Lynn-Marie does her own propagation of these and we find them to be a bit slow to grow on, but well worth the wait.